In this comparison, we’re looking at two similarly priced and favored treadmills — The NordicTrack 2450 and the Sole F85. At Treadmillreviews.com, we’ve written extensive reviews for each treadmill that go into more detail about each machine. But, when you’re considering a serious purchase, a side-by-side comparison can help you make your final decision. In this review, we’ll compare general specs on each treadmill while offering our opinion when it comes to choosing one of these two great treadmills for your home gym. Cost – We rate these two treadmills in the same category on Treadmillreviews.com – “Under $2000”. However, their sale price fluctuates between $1500 and $2000 depending on sales and the time of the year. Generally, the Sole F85 is priced higher than the NordicTrack 2450. Weight Capacity – The Sole F85 has an astounding 400-pound weight capacity (100 pounds more than the NordicTrack 2450). Across the board, the Sole treadmills have higher weight capacities than most of their competitors. Available Programs – NordicTrack offers 40 different preinstalled workout programs. This doesn’t include many features offered with their iFit subscription which brings the total closer to 60 workout variations. While the Sole F85 only offers 10 preinstalled programs, they’re still very functional routines that provide a great workout. Dimensions – Both treadmills are large which is a normal expectation for treadmills in this price range. More expensive treadmills have larger, sturdier frames and decks (unless you are considering the Matrix TF30 which comes with many high-end features on a small but sturdy steel frame). Size preference for the treadmill will vary based on your space allowance. If you’re looking for something that can have a dedicated space in your home, larger/heavier treadmills will be fine. But if you need something you can store or easily move out of the way, you may want to weigh your options with a smaller/lighter treadmill. In the case of the Sole F85 versus the NordicTrack 2450, one is longer while the other is taller. There is no clear winner in this category. They’re both big. Category Winner – It’s a tie. Running Surface – Each treadmill has a 22-inch by 60-inch running surface and a 2-ply belt. Folding – Both treadmills are folding treadmills. They each have lift-assist with a hydraulic shock system that allows for easy folding and unfolding of the deck. Both treadmills release slowly to the ground so neither presents a need to worry about damage to the floor or machine if you were to let the deck lower on its own. The deck of the Sole F85 can be released using a convenient hand lever at about eye level while the NordicTrack 2450 deck is released using a foot lever at the base of the machine. The Sole F85 has a slightly easier release mechanism. The NordicTrack 2450 has a convenient bar for raising and lowering the deck while the Sole F85 does not. The slight differences between the raising and lowering of these two decks do not qualify a significant winner in this category. Motor Size – Both treadmills are equipped with a 4.0 CHP motor. 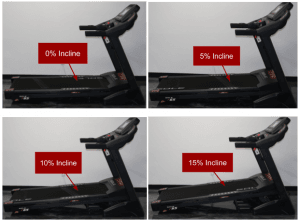 Incline Range – While a 15% incline is expected at this price point and both treadmills offer this capability, the NordicTrack goes a step further with an optional 3% decline. Speed – Both treadmills max out at 12 mph. Fans – Unsurprisingly, the NordicTrack 2450 fans significantly outperform the Sole F85 fans. We’ve found this to be true at nearly every price point. NordicTrack treadmills come with fans that produce a good amount of wind while their competitors have fans that are practically useless. Heart Rate Monitoring – Both treadmills offer hand grip heart monitoring (which is basically obsolete at this point) as well as Bluetooth heart rate monitoring chest straps. The chest straps are what to look for in heart rate monitoring technology. While hand grips do offer a bit of data, they’re often inaccurate and not a true representation of your entire workout. With heart rate monitoring chest straps, your treadmill is fed a constant stream of data to calculate your overall performance. As both treadmills offer this feature, they’re both winners in this category. 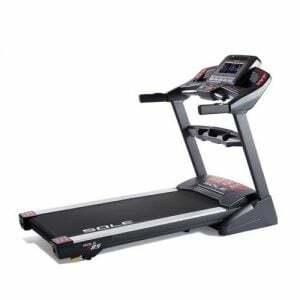 Treadmill Weight – Sole claims the weight of the Sole F85 is 301 pounds. While NordicTrack has not published the weight of the NordicTrack 2450, we can tell you that both are similar. Both have decks that are easy to raise and lower. Both have wheels at the base for moving the treadmill across the floor. Both stay in place while running on the treadmill. Materials – The NordicTrack 2450 is made with a steel frame and covered in lots of plastic components. While it looks nice and is easy to clean, it seems very vulnerable to cracking. The Sole F85 also comes with components that are made of plastic but more exposed materials of the treadmill are solid steel with an epoxy powder coat finish. While the NordicTrack 2450 looks a bit nicer and more high-end, the Sole F85 seems to be more durable over the long haul. Sturdiness – Both treadmills are built with a steel frame. Running on each at full speed is comfortable and well-supported through the console. However, if you stand on the treadmill and lean on the handrails, there is more give in the Sole F85. But again, while in use and without putting pressure on the console, both treadmills are sturdy. It’s a close call but also, kind of a big deal to treadmill users. For “Build Quality”, the F85 was rated 9/10 and the 2450 received 10/10. We feel the sturdiness of the NordicTrack 2450 will be more reliable in the long term. 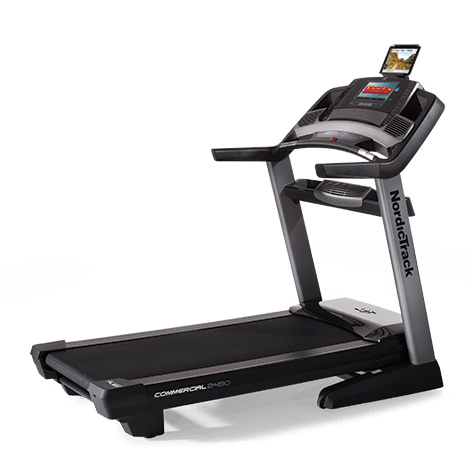 Moving the treadmill – The Sole F85 is easier to move around than the NordicTrack 2450. In the folded position, the F85 has four wheels touching the ground for moving across the floor. This allows you to move the treadmill with an easy push. The NordicTrack 2450 has 2 wheels contacting the floor while folded. With only two wheels, you’ll have to lean the treadmill onto its two wheels, with the stationary legs in the air in order to move the treadmill across the floor. This is more difficult as you have to carry a good amount of weight while directing the treadmill where you want it to go. Cushioning – Both treadmills offer cushioning in their deck. The Sole F85 comes with their patented Cushion Flex Whisper Deck. There are no options for increased or decreased cushioning on this treadmill. The NordicTrack 2450 comes with their patented Runners Flex Cushioning. This cushioning is adjustable, meaning you can have it on or off (Road of Soft). Both treadmills offer comparable cushioning, neither outperforming the other. Assembly – We assembled both of these treadmills in our testing facility and both assemblies were as expected. As we have found with more expensive treadmills, larger components of these treadmills come pre-assembled. We had no trouble with the assembly of either treadmill but the Sole was just slightly easier to put together. Speed and Incline Controls – We favor the speed controls on the NordicTrack 2450. The keys down the sides of the console allow for quick and unencumbered changing of the speed and incline which is great for speed training, Tabata, and HIIT workouts using the treadmill. Fan Controls – Both consoles allow easy access to the fan controls. Program Selection – The Sole F85 is a low-tech treadmill compared to the NordicTrack 2450 which makes this category difficult to judge. While the Sole F85 offers much simpler options for selecting a program, the NordicTrack 2450 does a great job of simplifying program selection for the user while offering a vastly larger selection of programs. Visual Display – We prefer the sleek look of the NordicTrack 2450 to the red and outdated visual display of the Sole F85 console. From the 2450’s rotating 10” HD touchscreen, to their unintrusive keyboard, it has a more modern design than the bulky rubber buttons of the Sole F85 (not a touchscreen). Although, there is still a large audience of users who would prefer the simpler, more age-friendly UI of the F85’s console. Speakers – Both treadmills have speakers in the console with a comparable sound output. You can project music from your personal device through the consoles speakers as well as plug into the console to channel the sound through your headphones. USB Port – The NordicTrack 2450 offers a USB/charging port while the Sole F85 does not. Other Entertainment Features – The NordicTrack 2450 offers a wider range of workout programs varying from Google Maps routes to guided routines by professional trainers. The NordicTrack 2450 gets bonus points from us because we’re always impressed by the level of engagement users can expect from their training programs on the treadmill. Data Display – During your workout, both treadmills display sets of data so you can measure your progress. While they both display typical data sets for a treadmill at this price point, the NordicTrack 2450 provides more information than the Sole F85 — making the 2450 a better measurement of your progress. You can see in the chart below the added benefit of running on the NordicTrack 2450 compared to the data tracking of the Sole F85. Fitness Apps – NordicTrack and Sole each has a fitness app/program that pairs with their treadmill. Currently, there is a membership fee for iFit Coach (NordicTrack’s fitness program) of $39.99 a month, while the SOLE Fitness app is free. Both apps allow you to sync with the treadmill you’re on. It will then track and store the data from your workout. The SOLE Fitness app allows you to control your treadmill with the phone, setting programs, changing speed and incline, etc. You can also go into “Outdoor Mode” if you choose to go outside and either bike, walk or run. It will then track your location to calculate distance, time, and calories burned. Then it stores this data as well so you can see a compilation of your efforts over time. Compared to the iFit app, the SOLE Fitness app offers few applications. Are you wondering why the iFit Coach app costs a whopping $40 per month? It’s essentially a fitness program designed to replace a gym membership. It does everything the SOLE Fitness app does (minus controlling your treadmill from your phone) as well as offers very engaging workout videos where you can run with motivating trainers all around the world. You get to pick a route (knowing in advance the difficulty level, distance, duration, and calorie burn) somewhere in the world and a certified trainer physically runs the route while coaching and educating you. As the trainer hits an incline or decline, your treadmill also inclines or declines automatically to provide a workout similar to the runner in the video. Your treadmill adjusts slowly when trying to keep up with the video. So although you aren’t getting a completely real-time experience, you’re still receiving a more varied and entertaining workout. This feature is incredibly engaging and fun. It’s one of the reasons we really love NordicTrack treadmills. They’ve found a way to eliminate boredom from a treadmill workout and that’s something we can all benefit from. However, we do wish they would offer their programs at a lower monthly rate. It’s a close call when comparing the pro’s and con’s to the iFit Coach app and the Sole Fitness app. iFit offers so much more while Sole offers enough, for free. But when we compare treadmills, we end up favoring the NordicTrack lines over other competitors because of all that you get from the iFit experience. Regardless of the fee, iFit offers treadmill users a much better treadmill experience. No interest if paid in full in 18 months. Standard APR of 29.99% after 18 months. Interest will be charged starting from the purchase date. After 18 months, interested is backdated to the purchase date and also charged from the current date on the remaining balance (+backdated interest). So this is a great option if you’re able to pay the treadmill off within the promo period (18 months). But you’ll get hit with outrageous interest fees if you do not pay the treadmill off within 18 months. You are required to make minimum payments each month. BUT the minimum payment is not calculated to pay off the treadmill in 18 months. You’ll need to make a higher payment than the minimum in order to avoid interest fees. This calculation will vary depending on the original purchase price. 30-day trial period. Full refund minus 10% restocking fee and shipping fees unless machine is damaged or defective on arrival. Treadmill must be returned in good condition, including original packaging and paperwork. If these things are missing, you will also pay an additional 10% fee. Service can be performed in your home for a fee. You may also be asked to ship your treadmill for service, then being charged for the shipping. 30-day trial period on all of our equipment. If you are not completely satisfied with your product, they will refund your purchase amount and freight charges both ways, no questions asked. All the customer is responsible to pay is an 8% restocking fee within the 30-day trial period. Some stipulations regarding original packaging. Lifetime warranty on motor, deck, and frame; 5 years for parts and electronics, 2 years for labor. All service is performed in your home. The Sole F85 and the NordicTrack 2450 are comparable in 11 out of 27 categories. But the NordicTrack 2450 takes the cake for 13 categories with the Sole F85 winning only 4. At treadmillreviews.com, we prefer the NordicTrack 2450 to the Sole F85 when you consider its price point, specs, entertainment features, build quality, and data tracking. But your favorite treadmill may vary based on a number of personal preferences, wants, and needs. If you’re interested in purchasing either of these treadmills, click here for instant savings and coupons! Thanks for reading our review and good luck in your fitness endeavors.